McDonald's is poised to continue the great American tradition of pretending like certain desserts are also breakfast food. The Golden Arches announced February 11 that it will introduce Donut Sticks to its breakfast menu for a limited time starting February 20. The Donut Sticks are described in the press release as "sprinkled with cinnamon sugar for a crunchy outside and soft, doughy inside." In addition to the nationwide release next month, they'll get a limited roll-out at select locations in time for Valentine's Day. The Donut Sticks basically look like churros (that's not a bad thing) and look like someone was taking notes when Dunkin' released Donut Fries last summer. 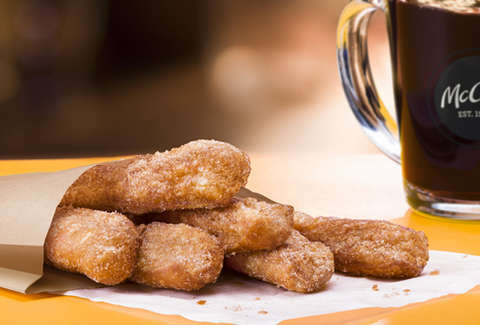 "We looked at several donut shapes, tested a variety of doughs and even worked to get the amount of cinnamon sugar just right for the recipe," said Linda VanGosen, McDonald's vice president of menu innovation. Though breakfast is available all day, CNN says that the Donut Sticks will only be available during morning hours. Breakfast has been at the forefront of McDonald's news recently. Notably, it expanded the breakfast menu for the first time in five years in October. CNN notes that this is because breakfast is the "final frontier" for restaurants. More people eat breakfast at home than any other meal, so it has the greatest potential for growth. While sales were flat overall in 2018, breakfast sales rose 1%. So, this may not be the last breakfast innovation coming from McDonald's and its competitors. The move helps them not only compete against the usual burger chains its fighting with (Hey, Wendy's), but donut chains like Dunkin' and quick-service restaurants moving into breakfast such as Taco Bell.